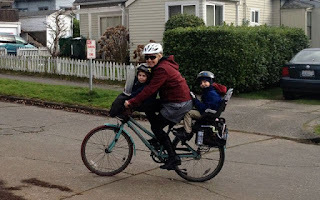 I'm pretty excited to share another family biking story with you this time, though I should admit it's technically not a Vancouver biking family--though they have ridden bikes here--but a Seattle biking family. Madi Carlson is a blogger (FamilyRide.us) & family cycling advocate, mother of two boys: Brandt, age 8 & Rijder, age 6. Madi has a wealth of knowledge about cycling & recently published a book: Urban Cycling: How to Get to Work, Save Money, and Use Your Bike for City Living. 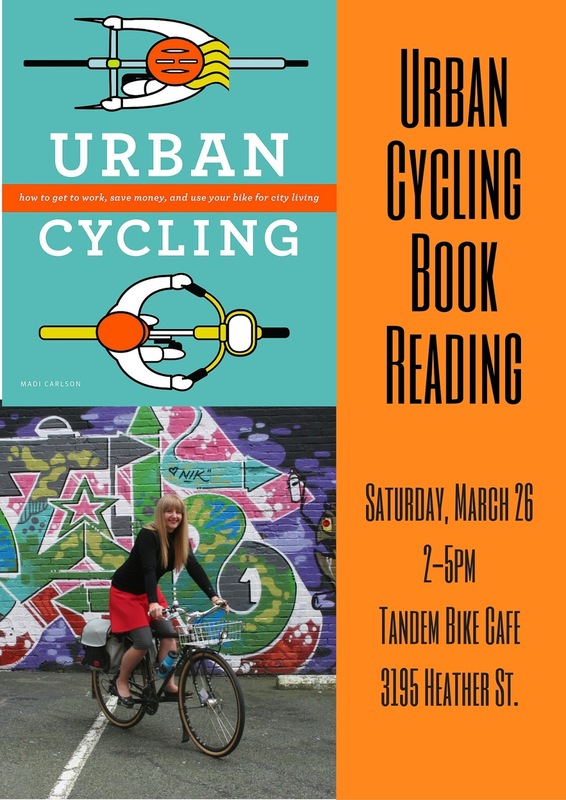 I'll be reviewing it soon, & Madi will be HERE in Vancouver this weekend, so if you'd like to meet her, buy her book & pepper her with questions about family biking, come to Tandem Bike Cafe between 2 & 5pm Saturday, March 26! RSVP & more details here. biked a lot in college, but after that went back to biking to various jobs only when it was much more convenient than driving or using public transit. 2. When did you start riding with the kids? What gear do you use to get them around & how did you modify it? With my first kid, I waited until he was one and got the same front baby seat all my cousins in the Netherlands used--the Bobike Mini. I put it on an old too-big single speed beach cruiser with coaster brake and made do like that for a year. But at seven months pregnant with my second child, I upgraded the bike to an eight-speed city bike with hand brakes. (ten weeks old, thanks to babywearing! ), I put him in an infant car seat in a bike trailer and toted my toddler to various destinations on smooth roads and paths while the baby happily slept in the trailer. That worked for over a year and then I moved the baby to the Bobike Mini front seat and added a Bobike Maxi rear seat for the three-year old. the big kid. Now I have Xtracycle Hooptie hand rails on it. We also recently got a second-hand tandem bike to which I added a kidback (a second set of cranks and pedals up high to accommodate a little stoker). I put a Burley Piccolo trailer bike behind the tandem and we all three have pedals! And they also have their own bikes--lightweight Islabikes--that they ride a lot of the time. I always take the Big Dummy when they're on their own bikes because one or both of them invariably gets tired or we get to too busy a road and I can carry both kids and bikes. 3. Where do you ride these days? Favourite place to bike to with the boys? We ride everywhere! Except for school. We live two blocks from school so it takes much longer to get the bikes ready and helmets on than it takes to just walk over. We love trips to the beach, six miles away, and five miles to the Seattle Center for a great play structure, museums, and fountains. I'm looking forward to summer when the days are long and we have time to bike to beaches 15 miles away. 4. What were the hardest things about getting started riding with kids? Do you have any tips for other families? 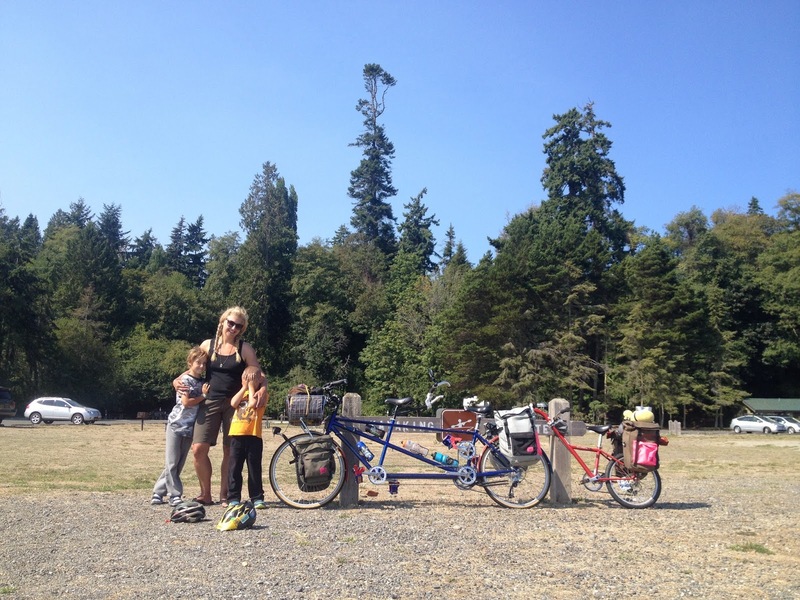 beginning, by keeping family biking adventurous, the kids are always happy to get out and go. Now it's commonplace enough that we can treat it was mere transportation, but it's still fun to take advantage of the adventurous nature of biking, like parking and standing on the deck of the bike to pick plums or detouring to watch an exciting construction project. When we've had struggles over certain important things, like not wanting to wear mittens on very cold days, I find creative silly solutions, like wearing a pair of my wool socks over their hands. 5. What would you change about biking in Seattle? What are you doing to make things better? What can other people do? the more people out on bikes, the safer it is (see more about safety in numbers on CityLab) so I focus on that, too. Other people can do the same: ride more and encourage friends to ride. Support Familybike Seattle so we (full disclosure: I'm on the board of directors) can introduce biking as a means of a sustainable lifestyle to more families of all income levels. Join the Seattle Neighborhood Greenways group for their neighborhood to advocate for safe streets. Editor's note: If you're in Greater Vancouver, I'd suggest joining HUB to support cycling advocacy & education. 6. What do you like about biking in Seattle? organization in the US and Seattle Neighborhood Greenways has many volunteers advocating for safe streets for all ages and abilities. 7. What other rides & book events have you got coming up? I lead group rides at least once a month--family-friendly rides called Kidical Mass and women-specific rides called Critical Lass. I'm a volunteer ride leader through Cascade Bicycle Club and upcoming rides will be listed on their Free Group Rides calendar. Upcoming book events are April 30th at the Burien Public Library, south of Seattle, and May 20th at the University of Oregon in Eugene, Oregon. I post all my book events at madicarlson.com. Thanks for a great interview, Madi! 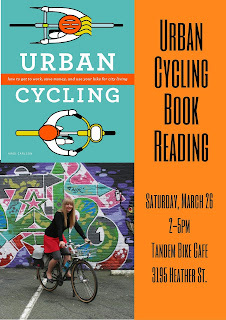 Remember, if you want to meet Madi & maybe even get a book signed, come to Tandem Bike Cafe between 2 & 5pm Saturday, March 26! RSVP & more details here. She'll also be joining us for the #YVRFamilyBiking Easter Bonnet Ride on Sunday morning. RSVP, route map, & more details here.